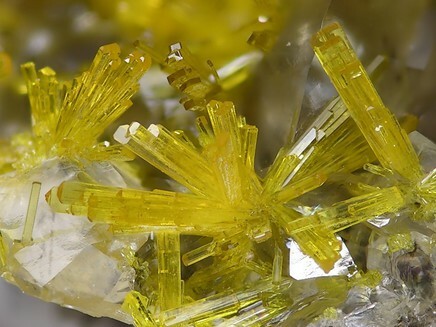 Uranophane-β: Mineral information, data and localities. Named as the dimorph of uranophane. May convert to uranophane on crushing. Uranophane 8 photos of Uranophane-β associated with Uranophane on mindat.org. Umohoite 6 photos of Uranophane-β associated with Umohoite on mindat.org. Haiweeite 5 photos of Uranophane-β associated with Haiweeite on mindat.org. Torbernite 5 photos of Uranophane-β associated with Torbernite on mindat.org. Calcurmolite 4 photos of Uranophane-β associated with Calcurmolite on mindat.org. Calcite 3 photos of Uranophane-β associated with Calcite on mindat.org. Fluorite 3 photos of Uranophane-β associated with Fluorite on mindat.org. Autunite 3 photos of Uranophane-β associated with Autunite on mindat.org. Baryte 3 photos of Uranophane-β associated with Baryte on mindat.org. Studtite 2 photos of Uranophane-β associated with Studtite on mindat.org. Vestnik Kral. Ceske Spol. Nauk (1935), 2/7, 1-36. American Mineralogist (1972): 57: 321-322. American Mineralogist (1981): 66: 610-625. Viswanathan, K. and Harneit, O. (1986) Refined crystal structure of β-uranophane Ca(UO2)2(SiO3OH)2.5H2O. 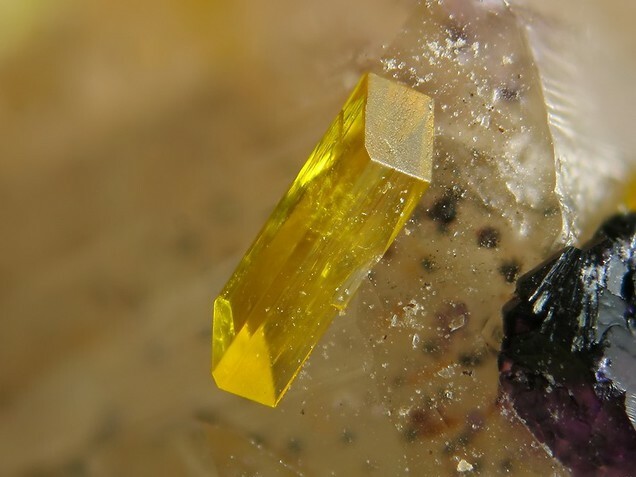 American Mineralogist (1986): 71: 1489-1493. Dill, H. G., Hansen, B. T., & Weber, B. (2013). 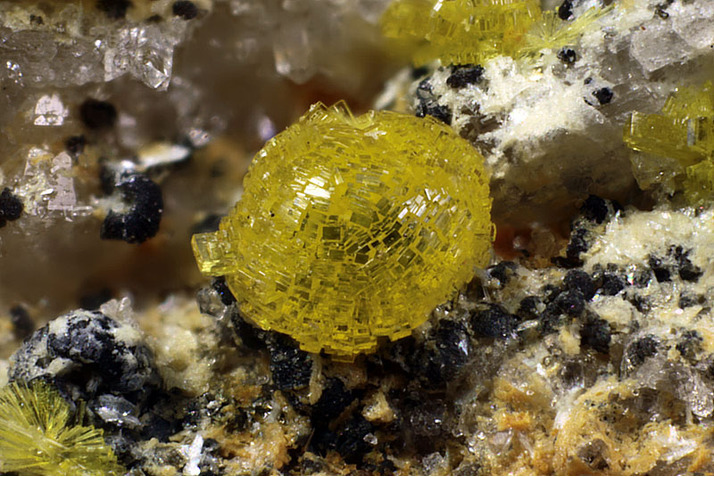 U/Pb age and origin of supergene uranophane-beta from the Borborema Pegmatite Mineral Province, Brazil. Journal of South American Earth Sciences, 45, 160-165. Guastoni A., Gentile P., Zorzi F. (2016): Uranophane-β di Boarezzo, Valganna (VA). Novità di mineralogia sistematica italiana. Rivista Mineralogica Italiana, 50, 2 (2-2016), 120. Ref: Daniele Ravagnani - I giacimenti uraniferi Italiani ed i loro minerali - Gruppo Mineralogico Lombardo-Museo Civico di storia Naturale di Milano - Milano, 1974, pp. 152-153; Piccoli, G. C., Maletto, G., Bosio, P., & Lombardo, B. (2007). Minerali del Piemonte e della Valle d'Aosta. Associazione Amici del Museo F. Eusebio - Alba, 607 pag. Piccoli, G.C. (2002): Minerali delle Alpi Marittime e Cozie. Provincia di Cuneo. Amici del Museo "F. Eusebio", Ed., Alba, 366 pp. ; Piccoli, G. C., Maletto, G., Bosio, P., & Lombardo, B. (2007). Minerali del Piemonte e della Valle d'Aosta. Associazione Amici del Museo F. Eusebio - Alba, 607 pag. Olmi F., Sabelli C., Senesi F., Stara P., 2002. La mineralizzazione uranifera di Arcu su Linnarbu. Riv. Miner. Ital., 3: 148-169. Pieczka A., Gołębiowska B. 2002: Pegmatites of the Szklarska Poręba Huta granite quarry: preliminary data on REE-mineralization. Mineralogia Polonica, vol. 20, 175-177; Mochnacka, K., Oberc-Dziedzic, T., Mayer, W., & Pieczka, A. (2015). Ore mineralization related to geological evolution of the Karkonosze–Izera Massif (the Sudetes, Poland)—Towards a model. Ore Geology Reviews, 64, 215-238. - Meisser, N. (2012): La minéralogie de l'uranium dans le massif des Aiguilles Rouges. Matér. Géol. Suisse, Sér. géotech. 96, 183 p. ; Meisser, N. (2012): La minéralogie de l'uranium dans le massif des Aiguilles Rouges. Matér. Géol. Suisse, Sér. géotech. 96, 183 p.
Anthony, J.W., et al (1995), Mineralogy of Arizona, 3rd.ed. : 408; Bollin, E.M. & P.F. Kerr (1958), Uranium mineralization near Cameron, AZ, in New Mexico Geol. Soc. Guidebook 9th Field Conf., Black Mesa Basin, northeastern AZ: 164-168; Galbraith, F.W. & D.J. Brennan (1959), Minerals of AZ: 111.; Bollin, E. M., & Kerr, P. F. (1958). Uranium mineralization near Cameron, Arizona. In Guidebook of the Black Mesa Basin, northern Arizona: New Mexico Geological Society, 9th Field Conference Society Guidebook (Vol. 9, pp. 161-168). Anthony, J.W., et al (1995), Mineralogy of Arizona, 3rd.ed. : 408; Austin, S.R. (1964), Mineralogy of the Cameron area, Coconino Co., AZ, US Atomic Energy Comm. RME 99, Tech. Inf. Serv., Oak Ridge, TN: 99. Anthony, J.W., et al (1995), Mineralogy of Arizona, 3rd.ed. : 408; Granger, H.C. & R.B. Raup (1969), Geology of uranium deposits in the Dripping Spring quartzite, Gila Co., AZ, USGS PP 595. Murdoch, Joseph & Robert W. Webb (1966), Minerals of California, Centennial Volume (1866-1966): California Division Mines & Geology Bulletin 189: 104. Hewett, Donnel Foster, Stone, J., and Stieff, L.R. (1969) The ages of three uranium minerals, Mojave Desert, California. USGS Prof. Paper 650-B: 87; Saul, R.B., Evans, J.R., and Gray, C.H. (1970) Mines and mineral resources of Riverside County. California Division of Mines and Geology County Report 9. Unpublished manuscript: 1209; Pemberton, H. Earl (1983), Minerals of California; Van Nostrand Reinholt Press: 303, 516. Chesterman, C.W. & O.E. Bowen, Jr. (1958), Fluoborite from San Bernardino County, California (abstract): Geological Society of America Bulletin: 69: 1678-1679; Murdoch, Joseph & Robert W. Webb (1966), Minerals of California, Centennial Volume (1866-1966): California Division Mines & Geology Bulletin 189: 104, 379.; Otton, James K.; Glanzman, Richard K.; Brenner-Tourtelot, Elizabeth F. (1980) Uranium, rare-earth and thorium mineralization at the Hope Mine, eastern Bristol Mountains, San Bernardino County, California. USGS Open file report 80-821. Clifford Frondel (1956) Mineral Composition of Gummite, American Mineralogist 41:539-568.; Korzeb, Stanley L.; Foord, Eugene E. and Lichte, Frederick E. (1997): The chemical evolution and paragenesis of uranium minerals from the Ruggles and Palermo granitic pegmatites, New Hampshire, Canadian Mineralogist: 35: 135-144. Rocks & Minerals (Sept/Oct 1981). ; Korzeb, Stanley L., Foord, Eugene E., and Lichte, Frederick E. (1997) The chemical evolution and paragenesis of uranium minerals from the Ruggles and Palermo granitic pegmatites, New Hampshire. Canadian Mineralogist, 35, 135-144.